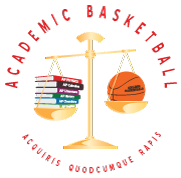 Academic Basketball™ starts with the only grassroots program focused on working with student athletes with a minimum GPA of 3.3 and leads to exposure to the coaches of the top academic colleges in the country with the expressed intention of helping each player earn a college uniform. Based in Fairfield County Connecticut and Westchester County NY, ABC plays in tournaments throughout the northeast, encourages its players to attend selected camps at the top academic universities and then plays as a Team at the Academic Basketball Camp and the All-Academic Camps at Pomona College in June and Brandeis University in July. Rule #2: Acquiris Quodcumque Rapis. The price of the initial consultation with us is for the student athlete to email us what Rule #2 means and why he/she believes we want to start our first conversation this way. This applies to playing on one of our Teams and for our assistance with helping the student athlete to find the “right” school. Why do we do this? Because we can. And we know it’s worth our effort – sort of our investment in the future of some of the kids we believe in who can make a difference. Simply put, we care. We would like to make a statement on the matter of rules, compliance and the actions of others that have caused many to take issue with AAU basketball in the macro, which is why we are eschewing identification with aau and referring to the genre as Grassroots, and with a team or coach in the micro: Not only do we know the rules (both the letter and spirit) we wholeheartedly pledge/endeavor/mandate ourselves to follow them without fail every day that ends in a "y." We maintain a higher standard for ourselves than others expect of us. In all matters, we live by the Golden Rule in addition to Rules #1 and 2.